Check out Porter's site... Awesome + How cool is that green car?? Owning a Karmann Ghia is on my life list... I dream big. my mom used to have a bright orange Karmann Ghia before I was born. I wish she still had it!! LOVE this! What a great color green. Such beautiful cars. I have always wanted one, too. 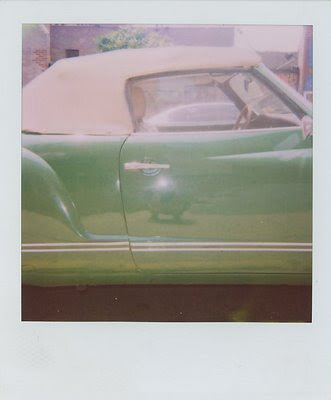 And there really is nothing more beautiful or nostalgic than a polaroid picture. We must do something to get them to start making it again. Thanks for sharing this- it is a bright spot to the day. I have always wanted a K.G. too -- well, that or an M.G. Midget or Fiat Spider. My parents wouldn't let me have one when I turned 16 and I have never forgiven them. my first car...the summer of my sixteenth year! my dad was king of the summer car surprises! just checking in...xoxo. I'm so happy that you're enjoying the polaroid project! That car is amazing. I would die to have one too. I guess one can dream. mrs. french -- would love to race you in a KG...so fun! porter -- i can't stop looking at your photos! Very lovely - the colors are great! I already know this is going to be a new favorite site!